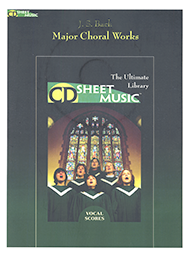 This CD contains the vocal scores of Bach's monumental choral works. Included are Mass in B Minor, four other masses, St. Matthew Passion, St. John Passion, Christmas Oratorio, Easter Oratorio, motets, and Cantatas 201-215. This is over 2500 pages of sheet music.